Positive Medicine | Devoted to helping physicians live better lives. When physicians live better lives, their patients live better lives too. Positive Medicine is a program designed to help physicians live better lives. When physicians live better lives, their patients live better lives too. Discussions about the crisis of physician burnout are everywhere, from medical journals to mainstream media. The statistics are troubling with over half of all physicians reporting at least one symptom of burnout. Burnout is comprised of a constellation of symptoms, including emotional exhaustion, depersonalization, and a low sense of personal accomplishment, that affects physicians’ relationships to their work. Physician burnout can lead to negative health outcomes outside of work life, including depression, substance abuse, and weathered interpersonal relationships. Physicians are leaving medicine early, and the number who would recommend medicine as a career continues to decline. 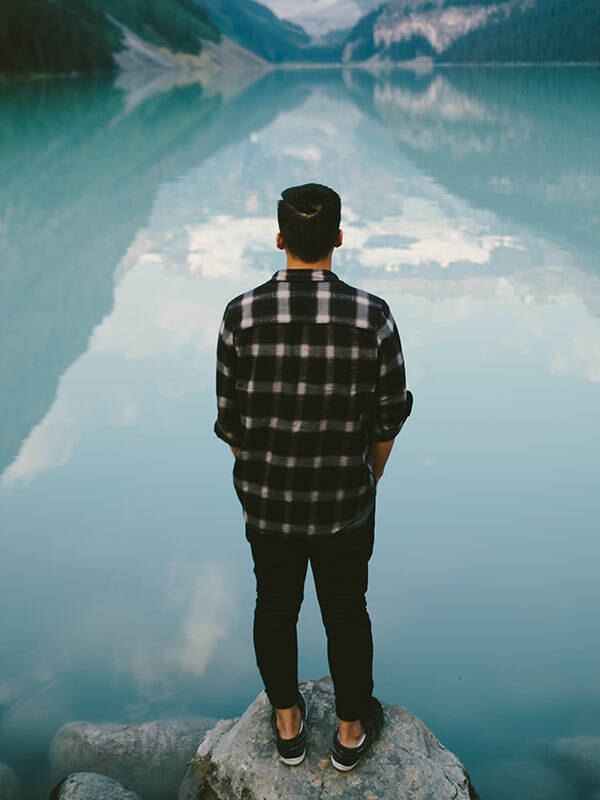 Experts cite both organizational and individual approaches to mitigate burnout including more flexible work schedules, the use of scribes, electronic medical record improvements, and structured interventions, such as mindfulness classes. These are steps in the right direction. The larger truth in this crisis is the absence of burnout does not equal the presence of well-being. Most physicians can function. We get through our days, make it to some of our kids activities and even manage to go out to dinner on the weekends. We survive the work week as we look forward to our next vacation. We do this because that is what we have always done. It is what we are asking our trainees and students to do. We put our heads down and do the work. We often project ourselves past the next exam or to the next stage of our lives to help us get through the stress. We become masters of delayed gratification. We develop the mindset of “I’ll be happy when…” I get into medical school or match into a good residency spot or make partner or have enough money to retire etc… Along the way, we may have some bright spots: falling in love, having kids, taking great vacations. We may even reward ourselves for our hard work with a new car or nicer house. We deserve it. But deep inside, “something is missing.” We have achieved most, if not all of the goals we have set for ourselves. Yet despite our hard work, many of us remain unfulfilled with our careers and often with our lives. What is it that we need? A better job with more money? A different car? A different title? Better vacations? How do I stop wanting what I don’t have and start wanting what I have? How can I fully enjoy the present while also preparing for a better future? How can I spend quality time with my kids while they are still around? How can I have a career that uses all of my potential? How can I serve as a role-model for my patients? How can I maintain the idealism that I had as a pre-med throughout my medical training? How can I help my colleagues and patients to pursue health, in addition to curing disease? Of all the questions that we’ve asked ourselves, perhaps the most important one was this: How can we learn to thrive, beyond simply surviving in our practice, and in our lives? Fortunately, we each found answers in an evolving field devoted entirely to the scientific study of flourishing: positive psychology. Unlike traditional psychology which aims to alleviate distress by moving a patient from a -8 to a 0 or +1 (if they are lucky), positive psychology focuses on a patient that is functioning at a +1 and tries to move them to a +8 on the flourishing scale. We need both areas of focus. There are many people that are functioning well by most standards but are nowhere near their potential level of fulfillment. Positive psychology can help. It provides a functional blueprint of evidence-based techniques and principles that can guide physicians away from burnout, beyond functioning, and toward flourishing… with downstream effects for their patients, and ultimately, for society. Utilizing Scientifically validadated assessments and physiologic measures. 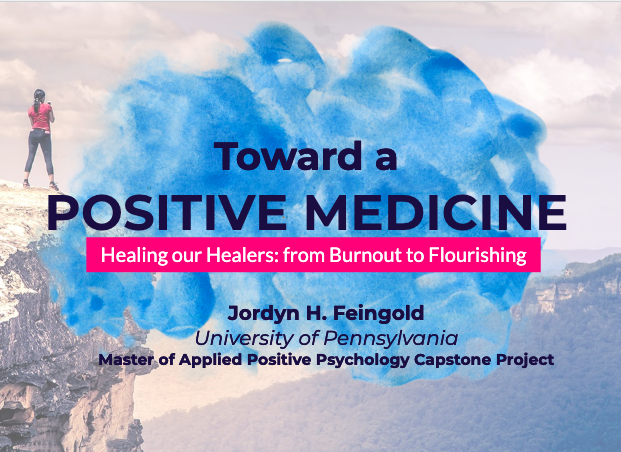 The Positive Medicine Program utilizes scientifically validated assessments and physiologic measures of well-being to create objective and meaningful change in physician’s lives. This evidence based program introduces the science of positive psychology. Key concepts that are specifically impactful for physicians include hedonic adaptation, resilience, mindfulness, and gratitude. The concepts are explored through personalized sessions, interactive exercises and take-home strategies that have been proven to increase lasting well-being. This program addresses the underlying root causes of discontent that many of us feel and tailors personalized solutions to optimize both external workplace stressors as well as individual stress responses. Through this program, physicians gain a scientific understanding of flourishing, and a toolkit of evidence-based positive psychology interventions that will enhance their professional and personal lives.